Back in December, Sport Business students visited Wimbledon/ the All England Lawn Tennis Club as part of their Sustainability and Leadership for Sport Organisations module. Sport Business and Leadership students have been spoilt with their visits to sports organisations in their first semester at Loughborough University London, with visits to UK Sport, Twickenham, and more. John, an enthusiastic Sport Business and Leadership student, has written a blog about his visit. For as long as I can remember, I’ve longed to step foot in the arena where Roger and Rafa played that jaw-dropping match in 2008, where Arthur Ashe became the first and only black man to win a singles title, where Serena has been dominant for years and where Andy finally became king. On December 6th 2016, myself and a fellow Sport Business and Leadership students were given the opportunity to walk on the same ground as some of the most successful tennis players. We started our day learning about the history of the oldest and most distinguished tennis tournaments in the world, Wimbledon. Founded 140 years ago, Wimbledon is 1 of 4 tennis tournaments called the majors or grand slams: The Australian Open, The US Open, Roland Garros (The French Open) and Wimbledon. In 1998, Wimbledon became the only major to be played on grass courts after the Australian Open switch to playing on hard courts. It is known for its strict dress code, where players are required to wear all white, from their head to their toes. Wimbledon has seen some of the world’s greatest players walk through their doors, with the likes of Pete Sampras and Roger Federer, having both won the highest amount of men’s singles titles in the open era (7), and the most successful women, Martina Navratilova having won 9 Wimbledon singles titles and Serena Williams having won 7 singles titles and 23 grand slams in total. During our time at Wimbledon, we were privileged enough to meet Dan Bloxham, who is the Wimbledon Championships Master of Ceremonies. Many of you may have seen him on the television, leading the players out onto the court during the championships. Dan provided us with an exquisite tour in which we were able to walk around Centre court, view both the men’s and women’s trophies and learn about some of the personalities and traits some of the world most famous players exhibit: Roger Federer’s “James Bond-Like” approach, Novak Djokovic’s “all round good guy” personality, Rafa Nadal’s “superstitious and focused” mentality and Andy Murray’s “less than interesting” mannerisms. Throughout this amazing experience, I couldn’t help but feel a continued sense of elitism within the establishment, from Wimbledon’s membership system all the way through to the dress-code which, wearing certain items of clothing, can prevent you from walking through certain corridors. Wimbledon is covered in history and prestige but it also reeks of elitism. As an avid fan of the tournament, I couldn’t help but asses my own ability to become a member of the prestigious organisation. But, you cannot discredit the prestige, history and the recognition Wimbledon has across the world which makes it the greatest tennis tournament in the world. This experience opened my eyes to the difficulties organisations such as Wimbledon have had to stay relevant in an ever changing and ever evolving world. From a sport business and leadership perspective, Wimbledon has undergone many changes and alterations to adapt to the changing market whilst staying true to its roots. The addition of roofs to courts and increases to the number of courts, alongside the limited courtside advertisements and unchanging traditions, Wimbledon has shown its versatility as an organisation that has been able to appeal to every generation since its inception. If there’s one thing I have taken away from my experience at Wimbledon thanks to Loughborough University London, it’s that sport has the power to bring together all manner of people, from the wealthy who rent their homes to players to those who provide their back gardens as camps sites, from the locals to the tourists. No matter how elitist the organisation might be, sport has the ability to put everyone in the same position, it doesn’t matter whether you sit at Centre Court or out in the open on Murray Mount, we all witness the excitement, magic and greatness of the game. Loughborough University London would like to thank Jonathan Reid for his blog. Find out more about our Sport Business and Leadership course on our website. 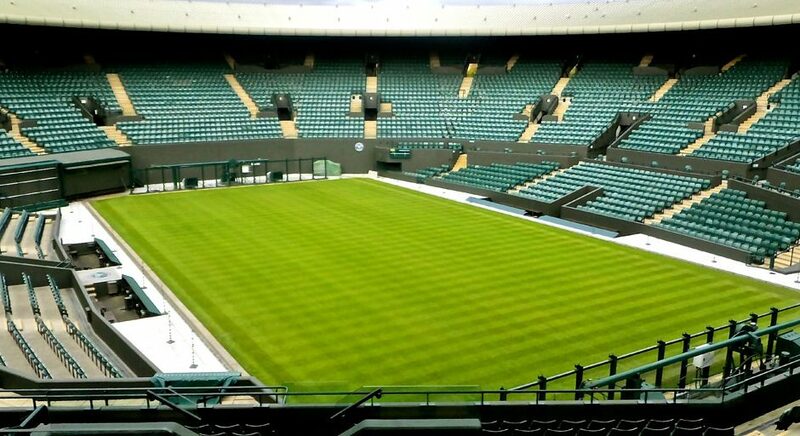 Find out more about Wimbledon and the All England Lawn Tennis Club on their website.